Ten-year-olds Oliver Blaise and Leonard Gu aren’t really sure what they want to be when they grow up. “I might want to be a scientist,” Gu said as he held up a spacecraft made of Legos that he and Blaise designed. ExploraVision is the world’s largest science competition for K-12 students. It challenges children to envision the technology of the future. 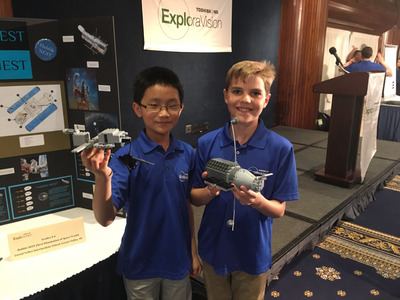 The spacecraft earned Blaise and Gu first place in the competition’s grade 4-6 category. The boys each received a savings bond worth $10,000 for their invention. They call it the Hubble NEST (Next Elimination of Space Trash). It’s goal: To rid the world of space junk orbiting the planet. And according to NASA, there are more than 20,000 pieces of debris larger than a softball orbiting the Earth. And that’s not including the millions of pieces of debris that are too small to be tracked. The concept is pretty simple: Repurpose the Hubble Space Telescope into a spacecraft that will seek out and eliminate space trash. But there was a major drawback to this plan. The Hubble isn’t outfitted with any propellants, so it can’t move forward on its own. Then, the drones will fly in and grab the space trash, either with “beaks,” or, if the space trash is abnormally large, with claws or suction cups. Blaise and Gu said that while designing the spacecraft was actually pretty easy, the research was the hardest part. That’s because right now, Blaise said, nothing is actively being done about the problem of space trash. So even if Blaise and Gu aren’t certain what they want to be when they grow up just yet, the world could certainly use creative thinkers like them to go into science. And Exploravision might just give them a nudge in the right direction. “It taught me a lot about space that I don’t think I would have learned if I didn’t do this,” Blaise said.